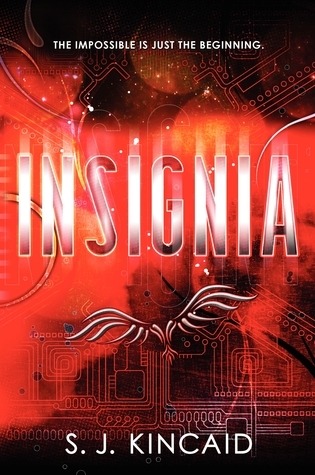 Insignia is the type of book that would have blown me away if I had been any younger. While it is marketed as a Young Adult Novel, I'd probably recommend it for mature middle grade students or young high schoolers. I definitely don't see anything wrong in reading it as an older teen, like me, but it simply doesn't have the desired punch on a much older audience. Tom lives in a futuristic world, not too far ahead from our very own, where World War III is fought solely in space without losing any lives. Yet, for Tom, war is the last thing on his mind as he struggles to make ends meet with his gambling father who constantly keeps moving him. However, when Tom's gaming prowess, which keeps him clothed, is discovered by the government, they recruit him to join the Pentagonal Spire where he is implanted with a neural chip that instantly makes him smarter than the average human being. At the Spire, Tom essentially trains to become a combatant soldier; yet, as he will soon learn, it isn't the game of battle he needs to learn quickest, it's the game of corporate politics, friendship, and corruption. I have to admit, that while I don't exactly recommend this novel for people my age and older, I still really liked it. Kincaid obviously has done a lot of research on futuristic technology, corporate politics, and the military and his passion for the subject shows through his writing. I loved the futuristic world he managed to create as it was both realistic and interesting. Plus, some of the gadgets and creativity with the technology absolutely astounded me. Furthermore, for being such a long novel, it was extremely entertaining, well-paced, and contained the age-old themes of friendship and loyalty which was a nice change from romance. I always like seeing a group of people grow to become a group of friends and dispel their previous qualms with one another, and the bonds of friendship in Insignia were no different. Yet, I was unable to truly fall in love with Insignia. For one, the novel contains some extraneous scenes which, while amusing, really do nothing for the plot and can be completely cut out or at least reduced. In addition, Tom, the MC, is much like a dystopian/futuristic Eugenides-lite. While he is intelligent, snarky, and clever, his antics become predictable after a point and fail to continue surprising the reader. Plus, the supposedly "deep" and "provocative" family relationships Kincaid tried to build didn't really come through for me and I felt as if the story would have been better if they were just skipped. Moreover, the miniscule amount of romance in this story was rather underdeveloped in my opinion. I suppose for a middle-grade novel it was good, but from an older perspective, I wanted more interaction. Yet, I have to admit it was unique and very interesting. Honestly, don't let my review deter you. Insignia is a brilliant piece of science fiction with scintillating characters and an extremely interesting plot built around corporate and governmental politics. I really enjoyed reading about this world Kincaid had created and would whole-heartedly recommend this to younger readers. While I'd love to see older readers read this one too, I feel as if their interest and "wow" factor would wane after a couple hundred pages; but, don't take my word for it, check it out yourself! Science Fiction! Say no more!! Sign me up! I appreciate your thoroguh critoque. It is kind of nice to see a YA book be more geared toward the younger end, more often they are for the older crowd. I like that is a fun science fiction book and that Tom is snarky. The predictability and such are a downer but overall it sounds promising! Great review, hun! I felt similarly to you, this was a good book but it definitely didn't wow me! Warren Buffett's 10 Best Investments for 2012 TheStreet. Gold Price; Winners & Losers; ETFs; Mutual Funds; FOREX. Warren Buffett's 10 Best Investments for 2012. 1) American Express Company has an implied upside. If a few years ago people chose the real estate industry to invest their money, they realized soon that there is no such thing as completely safe and stable investments tools except for the hard assets. Google provides a free mechanism for which the charge involved can take care of the payment . Expert investors as well as novice investors usually prefer this investment class. The Secretly Profitable Trade Of Investing In Diamonds Consumers prefer high resolution photos because they can be resized without losing quality. Be careful when you are choosing where to invest because securities fraud can effect anyone at any time.